Oorkaan creates high quality staged concerts for young audiences. Founded in 2000 in the Concertgebouw Amsterdam, Oorkaan is the only organization in The Netherlands that has dedicated itself exclusively to the creation of high quality staged concerts for young audiences. Our aim is to give every child the opportunity to experience the power of live music. The staged concerts for 1,5 to 12-year-olds focus on all kinds of live classical music from all over the world, performed by outstanding musicians. For the creation of the productions Oorkaan has developed the internationally recognized Oorkaan Method, which makes it unique in the world. 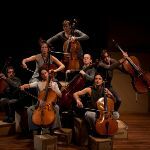 Under the artistic direction of Caecilia Thunnissen, Oorkaan presents about 7 music productions per season and organizes roughly 200 performances a year in The Netherlands and abroad. For each new production Oorkaan brings together musicians and artists from various disciplines. The staged concerts are without words, making them suitable for international tours. In the Research&Development department Oorkaan trains talented musicians in their performance and physical acting skills according to the Oorkaan Method. Theatre makersget the opportunity to experiment with the creation of musical productions for young audiences. The Education department presents a comprehensive educational program for primary schools, consisting of workshops, teaching materials and performances.